Perth-based writer Stephen Daisley is to be the 2017 Creative New Zealand Randell Cottage Writing Fellow. Daisley hit New Zealand headlines last year, when his second novel, Coming Rain, took out the inaugural Acorn Foundation Fiction Prize at the New Zealand Book Awards. 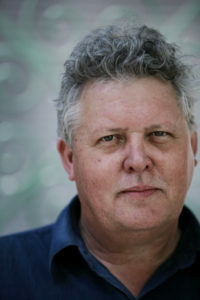 Although an unknown quantity in his homeland, Daisley has won or been short- and long-listed for major Australian literary awards, including the Prime Minister’s Literary Award for Fiction for his first novel, Traitor, the 2016 Miles Franklin Award and the 2011 Commonwealth Writers prize for best first book. Daisley’s Randell Cottage project is a novel with the working title The River Road: Te Ara au te Awa, the story of an emotionally damaged veteran of the Vietnam war, New Zealander Danny Walker. Selection panel convener Vincent O’Sullivan says “Stephen Daisley’s selection for 2017 continues the tradition of appointing the finest New Zealand writers for this much sought-after Wellington residency. And now, the bonus of a writer recognized by the highest awards in both New Zealand and Australia, having the chance to return to his own country to work on a novel intimately related to experiences in Asia, as well as in specific events and locations back home. “We’re looking forward to welcoming Stephen to the Cottage,” O’Sullivan said. 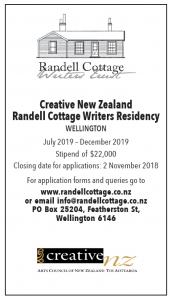 The Randell Cottage Writers Trust was established in 2002. The restored B-category historic, gifted to the Trust by the Price family, building hosts two writers a year; one from New Zealand and the other from France. It is currently home to Stephanie Johnson. The 2017 French resident, novelist and advocate Josef Schovanec arrives in Wellington in January 2017.